Earlier today, HUD issued a notice titled “Carbon Monoxide Detectors in HUD-Assisted Housing“ PIH 2019-06. The notice does three things. First, it reminds owners, managers, and agents of HUD-assisted housing that where required by local law, HUD-assisted housing (i.e., public housing, the housing choice voucher program, section 8 project-based rental assistance, section 202, and section 811) is required to have carbon monoxide (CO) detectors. Second, it strongly encourages those not required by local law to still install CO detectors in 1) units with fuel-fired appliances and burning appliances or an attached garage and 2) in bedrooms that contain a fireplace or a fuel-fired appliance or burning appliance. Third, the notice states that HUD will pursue rulemaking to implement a CO detector requirement in units with fuel-fired and burning appliances or attached garages for the housing choice voucher program, public housing, and the multifamily programs. The notice can be found here. On April 16, HUD released the Department’s 2019 Capital Fund processing information. The obligation start date is April 16, 2019 with an obligation end date of April 15, 2021. All funds must be expended by April 15, 2023. A list of capital fund awards by PHA can be found here along with additional information on processing. On Wednesday, April 17th from 3-4PM EDT the MTW Team will hold a conference call for all agencies eligible for MTW Cohort 1. Please join the call to get any questions you may have regarding MTW Cohort 1 and/or the application process answered. The conference begins at 3:00 PM Eastern Time on April 17, 2019; you may join the conference 5 minutes prior. Need technical assistance? Call the AT&T Help Desk at 1-888-796-6118 or 1-847-562-7015. HUD has announced they will be making available $1 million in funding to support the expansion of the Family Self-Sufficiency (FSS) program to new sites. HUD anticipates making 10-12 awards. This funding is not the FY19 Renewal FSS NOFA, which is forthcoming. This NOFA is only for PHAs that have not been funded within the last three years. HUD recommends interested agencies begin the process of collecting letters of commitment/MOUs from partners sooner rather than later as this process may take some time to complete. Potential applications may submit questions to fss@hud.gov. Applications are due Thursday, June 13. The NOFA is available at grants.gov. NAHRO is excited to host two webinars on the Moving To Work (MTW) expansion – April 23, and May 6. Both sessions are complimentary to attendees and additional information along with registration links are below. HUD has announced and extended the application process for the first cohort of MTW expansion which will include 30 smaller PHAs (less than 1,000 combined public housing and HCV units.) and the letter of interest deadline is coming up quickly. This webinar will provide small PHAs details on the application process and the HUD required information. The NAHRO Policy Team will walk attendees through the application timeline and the commitments that PHA must make. Bring your questions and comments and prepare your PHA for the MTW possibilities! The MTW Steering Committee, which works on behalf of the current 39 Moving to Work (MTW) agencies, and the National Association of Housing and Redevelopment Officials (NAHRO) will be hosting a webinar on MTW specifically for smaller size public housing authorities who are interested in the program. In 2015, Congress authorized the expansion of MTW to include an additional 100 agencies and HUD is currently preparing to select the first cohort of new agencies into the program, which will be comprised entirely of small PHAs. Small PHAs will also be eligible to apply for MTW in future application rounds. During the webinar you will have the opportunity to engage with and learn from current smaller-sized MTW agencies with many years of valuable experience operating under MTW. These agencies are widely recognized as experts and innovators in their local communities and at the national level. Our panelists will focus on the advantages and benefits of MTW, potential challenges, the application process, and other important topics. If you are a small PHA who has already applied or is considering applying to the MTW program in the future, we highly encourage you to take advantage of this opportunity to learn more about the program. HUD has released a NOFA for $5 million for FY19 Choice Neighborhoods Planning Grants, including Planning and Action Grants. Planning Grants are two-year grants that assist communities with “severely distressed public or HUD-assisted housing in developing a successful neighborhood transformation plan and building the support necessary for that plan to be successfully implemented.” Planning and Action Grants are three and a half year planning grants that “pair planning with action.” Under these grants, the planning process would take place during the first 24 months. The planning process will identify Action Activities that will be carried out during the latter portion of the grant period. Applications are due June 10. The NOFA and application package must be downloaded from http://www.grants.gov. Potential applications should send questions to ChoiceNeighborhoods@hud.gov. Clean Air for All, a partnership between NAHRO, Live Smoke Free, and NAR-SAAH, has just released its Compliance and Enforcement toolkit for smoke-free public housing. The toolkit provides tips on compliance and enforcement for public housing managers, resident engagement ideas, smoke-free compliance FAQs, and tips to promote conflict resolution. The toolkit also links public housing managers to cessation resources and provides sample tools PHAs can use to facilitate enforcement and compliance of the smoke-free policies. Learn more about Clean Air for All at smokefreepublichousingproject.org. On April 4, HUD will release two notices in the Federal Register related to Section 3. The first is a new proposed rule titled “Enhancing and Streamlining the Implementation of ‘Section 3’ Requirements for Creating Economic Opportunities for Low- and Very Low-Income Persons and Eligible Businesses,” which would update the regulations implementing Section 3. The second is titled “Section 3 Benchmarks for Creating Economic Opportunities for Low- and Very Low-Income Persons and Eligible Businesses,” that sets outcome benchmarks for meeting and following Section 3 requirements. 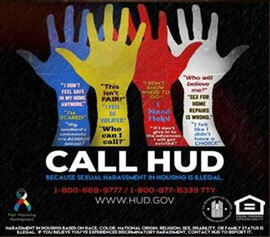 HUD also hosted a call the morning of April 3 on the proposed rule. NAHRO was the only participant to ask questions about the proposed rule on the call, specifically about changes to the definition of a Section 3 business, and the impact of the proposed rule on small agencies. According to HUD, “[t]he purpose of Section 3 is to ensure that employment, training, contracting, and other economic opportunities generated by certain HUD financial assistance are directed to low- and very low-income persons, particularly those who receive government assistance for housing, and for businesses to provide economic opportunities to low- and very low-income persons.” The proposed rule applies to HUD’s Public Housing program and other programs that provide HUD housing and community development assistance.